Below left: Donated by Pastorella Shelley in 1949; 1949.10.41These ornaments are made using the head hair of the deceased. The brooch and the necklace are made from the hair of two children, Bertie and Frankie Wilkins, in memory after their death; whilst the bracelet is made from the plaited and netted grey hair of the donor's great-grandmother. How did hair and jewellery combine in this way? Before the Victorian era locks of hair were used as a love tokens or keepsakes. Meanwhile, rings and jewellery had been among those items bequeathed by the deceased to family and friends for centuries. The practice was modified slightly by the 1500s when money was left instead to buy special commemorative and mourning rings. By the end of the 1600s, rings as well as buckles were distributed at the funeral service to be worn in memory of the deceased. Some of these incorporated hair as well as memento mori ('remember you must die') inscriptions and devices such as hourglasses, skulls, crossbones and skeletons. These reminded the wearer of the briefness of life and the necessity of preparation for the afterlife. 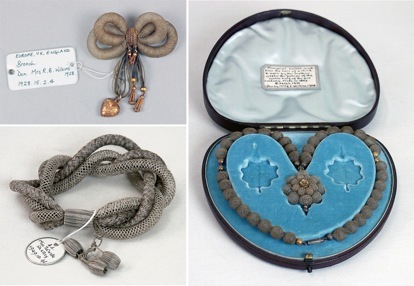 By the 1850s sentimental or commemorative jewellery made of entirely or partly of the hair of a loved one was used widely to mark important life events such as betrothals, weddings and death. The hair was worked, boiled and dried by professionals or prepared on a mould at home, before being sent to the jewellers to be mounted with metal settings. Since hair is mainly made of keratin – the protein found in feathers, claws, nails and hoofs – it is very durable and lasts for years. The use of hair in this way did not stop at jewellery either. Ladies armed with nimble fingers, pattern books and time to spare patiently created entire pictures of flowers and landscapes in hair. The Paris Exhibition of 1855 boasted a full-length, full-size portrait of Queen Victoria made entirely of hair. The rise and popularity of hair mourning jewellery was part of a wider shift in Western attitudes towards death. Concerns previously for the soul alone now extended to physical remains. Death in the Middle Ages had been seen as an unfortunate but inevitable event, the philosophical reaction to which can be summed up by the phrase, et morie-mur, 'and we all shall die'. In contrast, by the 18th and 19th centuries death was increasingly met with a dramatized and emotional response by the bereaved, who expressed an unwillingness to accept the departure of a loved one with no tangible reminder. Tombs got bigger, cemeteries became fashionable and necessary parts of the city to visit, the coffin was displayed or even buried "at home", and people even preserved parts of the deceased in jars. Hair jewellery, which could be worn for years afterwards and be passed down as a family heirloom, was part of this memorialisation trend, but it declined with along with Victorian mourning culture in general after the 1880s.